For a long time, I believed in the myth of sudden and instantaneous inspiration. I believed that an apple would hit me while sitting under a tree. I believed that lightning would strike my key while flying a kite in a storm. I believed that a tiny lightbulb would appear above my head when I had an insight. The biggest myth about creativity is that you will have these moments of clarity. That you don’t have to do any work for inspiration to strike. That you just have to wait for the muse to descend upon you. What I’ve learned through a lot of reading, some interviews, and a lot of effort is inspiration doesn’t work like that. If you want great ideas to come to you, you must seek them first. Creativity is a muscle, just like any other muscle. You must put it to use or it will atrophy. If you want to be creative, you must follow the stages of creativity. According to psychologist Scott Barry Kaufman, creativity comes in four basic stages. In order to come up with new solutions, you have to first learn a lot about the subject you are tackling. This is the information gathering stage. Then, you must walk away. This is the stage many people neglect. They pour over the problem until they can’t think anymore. But, you must let your mind wander if you want it to come up with a creative solution. This is the spark of inspiration many of us have been looking for. It is that moment when all those ideas you were exploring come together and finally make sense. Most people will stop once they have that eureka moment, but creativity doesn’t end there. Your idea must be put into action. Anyone can have a good idea, but true creativity is harnessing your ideas and putting them to use. Far too many people wait for the right moment before they take action. They want the benefits of success without the work required to achieve it. Luckily for you, you now know better. If you want good ideas to come to you, you must seek them. 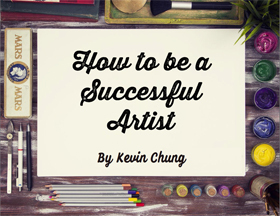 If you want to find success for your art, you have to do the work. Taking action is the only way to make your dreams come true. Don’t wait around for someone or something to give you an opportunity. Make your own opportunities. As creatives, we are often thought of as dreamers. We dream of our art being “discovered”. We dream of people clamoring over our work. We dream of a life where we can just create. The thing is, we are dreamers, but often times, we are not doers. A little over a year ago, I was a dreamer too. I dreamed that I could help artists get exposure for their work. I dreamed that I could help artists in the subject they are most uncomfortable: marketing. I dreamed that I could have my own podcast and share my thoughts with the world. I am no longer just a dreamer. I am a doer too. Instead of letting my dreams die, I took action on them. That is the only reason you are reading this. Without action, I would be like many creatives, dreaming my life away. There is nothing wrong with being a dreamer. In fact, I would argue it is absolutely essential for artists to be dreamers. The problem is, you can’t just be a dreamer. Dreams will get you nowhere without action. The only thing that separates those who succeed from those who don’t is taking action and not giving up. When I embarked on this adventure, I didn’t have everything planned out. Often times we want a perfect blueprint of what we should be doing and when we should be doing it. We want someone to tell us exactly what to do without figuring it out for ourselves. I’ll tell you this, the path to success is not linear. Nothing is ever perfect. If you have been waiting for the perfect formula to bring you success, you will be waiting a very long time. And that’s a good thing. If life were a formula you could just follow, it would quickly become dull. Life is about the journey, not the destination. I’ve talked to many creatives and one commonality they all have is their unconventional paths. No one told them what to do. They discovered it on their own. When we are children, we think the adults have it figured out. We think there is this magical switch that turns on and we’ll know exactly what to do. If you haven’t figured it out yet, that switch doesn’t exist. If you have a dream, there is only one thing left to do: take action. Instead of hoping your dreams will come true, make them come true. Everyone has regrets in life. There is always something we could have done. Something we should have taken action on. One great thing about the internet is you find so much inspiration online. Pinterest and Tumblr provide endless fashion inspiration for the masses. The only problem is, many times, the images you find have no attribution. I thought I had the solution for this problem. I started my last site Who Designed It years ago. My idea was, people could send in images of the outfits they saw online that had no attribution. Then the community on the site could help them find where to buy it or something similar to it. I told many people about my grand visions for the site. I thought it was going to revolutionize the way people shopped online. The only problem was, I didn’t take action on it. Instead of building the product I envisioned in my mind, I turned it into a blog. I was going to build up a readership, then introduce them to my new idea when the time was right. Then, a few years later, I saw that someone created the vision I had imagined years before. I was too late. I’m not telling you this so you can feel sorry for me. I’m telling you this because I learned a big lesson from this experience. If you have a vision you believe in, don’t just talk about it. Do it. Don’t let fear get in the way of doing something great. I don’t know if my idea would have failed or succeeded, but at least I would have taken the chance. Don’t let fear get in the way of getting started. Quit talking and begin doing. Have a quote that inspires you? Leave it in the comments and you might see it as an art piece!